The Antique sales on the lawn of the Brome Historical Society are a fantastic chance to touch and buy the rich historical treasures of the Victorian heritage. Everything from bintage furniture, to original arts and crafts can be found during the Knowlton Antique Sale and the permanent antique dealers in the area are definitely worth a visit! The lovely Museum grounds are full of unique antiques and wonderful crafts as the annual Antique and Craft Market turns the weekend in Knowlton into a magic trip through history via the incredible collection of fantatsical and forgotten articles from yesteryear. 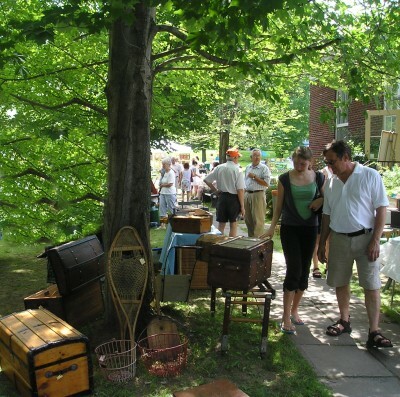 The annual Antique Sale in Knowlton is a popular event and when the week-end weather co-operates it cretaes an old fashioned Victorian atmosphere in the town that cannot be beat! While visiting the Antique Fair make time to visit the permanent Antique Stores in Knowlton on the main street not far from the Museum. The Musuem grounds are at 130 Lakeside, kitty corner from the Star Café, and the show is on the lawn from 10am to 4pm. Every Saturday throughout the summer the Town of Lac Brome (Knowlton) will be presenting a Farmer’s Market. Fresh vegetables, fruits, cheeses, smoked fish, homemade pies and fresh cut flowers will be offered in an outdoor market environment. The Market will be located at 48 Maple Street in Knowlton and will run from 10am to 1pm every Saturday. See you there! Children’s storytelling hour Brome Lake Books hosting another in its series of popular storytelling hours for children on Saturday August 5 at 11 a.m. Children of all ages are welcome and we have a special surprise guest! For more information please call 450-242-2242 or drop by Brome Lake Books 264 Knowlton road, Knowlton. Country music fundraising jamboree (2 p.m. – 9 p.m.) and BBQ (4 p.m. – 6 p.m.) at the Forand Park in Fitch Bay on Sunday, August 6, with performances by well-known local artists and guest stars. Proceeds go to “A Salute to Quebec Seniors”. Admission: $10, which includes hot dog, or hamburger – & drink.Salamander Summer Day camps begin at Legion Community Centre, 9 a.m. – 4 p.m. 450-242-2020. Antique and craft market sale at Brome County Museum, 130 Lakeside, Knowlton on Sunday, August 6, 9 a.m. – 4 p.m. Spaces available. Call: 450-2436782. Knowlton Harmony Band Sunday afternoon concert at Mill Pond (Coldbrook Park), Knowlton, 3 p.m. If raining, at Knowlton United Church. Pork and beef BBQ hosted by the Karnak Shriners “ET Club Estrie.” Thirsty Boot, 25 Bolton Pass. Supper around 5:30 p.m. Evening of music and dancing. Adults: $20, kids 5 – 12, $8. Tickets at the Boot or Leslie Hastie 450-243-0903. Proceeds to benefit the Shriners Club. The works of Rosemary Sullivan. Ongoing from August 4th to August 30th. The Vernissage will be held Sunday August 6 from 2pm – 5pm at the Dunham Public Library. For more information call 450-295-2273. Florals, landscapes and equine art pieces by local artist Rhonda Price at the Brome Countru Historical Museum, 130 Lakeside Street in Knowlton from 10am to 5 pm. Ongoing from August 12th – August 20th. Artists whose works will be displayed at Arts Knowlton include Gary Matthews from Aug. 8 – 19 and Louise-Andree Roberge from Aug. 22 – Sept. 2. The BCHS Museum, 130 Lakeside, will exhibit works of Gerarrl Schwartz, Aug. 5 and 6. The photography of Stansje Plantenga will be exhibited at Pettes Library, 276 Knowlton Rd., from Aug 1 – 31. Honky Tonk Blue with Laura Teasdale and Ralph Steiner, on Aug. 31 at 2 p.m.; Sept. 1, 2 and 3 at 8 p.m.
God’s Troubadour highlighting the special magic of St. Francis of Assissi, written and directed by Laura Teasdale, and starring Danielle Desormeau will be performed beside the Mill Pond in Knowlton, Aug. 1, 3, 9, 11, 17 and 19. Free concerts featuring the Arion Ensemble at the Old Brick Church, West Brome will be held July 8 at 8 p.m. and July 9 at 11 1 a.m and 3 p.m. The Brome Lake Concert Ensemble will perform at the gazebo, Coldbrook Park on July 19 from 6 – 7 p.m.
Come celebrate one of the oldest and most prestigious agricultural fairs in Eastern North America! The Brome Fairgrounds come alive with a midway, music concerts, animal shows and awards, agricultural events, demonstrations and good old fashioned carnival fun as the Brome Fair turns Knowlton into the center of the universe! Come out with the whole family and experience the ultimate end-of-summer experience known as the Big Brome Fair! Every Saturday in August in Knowlton, Lac Brome throughout the summer the Town of Lac Brome (Knowlton) holds a Farmer’s Market where fresh vegetables, fruits, cheeses, smoked fish, homemade pies and fresh cut flowers will be offered in an outdoor market environment. The Market will be located at 48 Maple Street in Knowlton and will run from 10am to 1pm every Saturday. See you there for coffee and goodies! 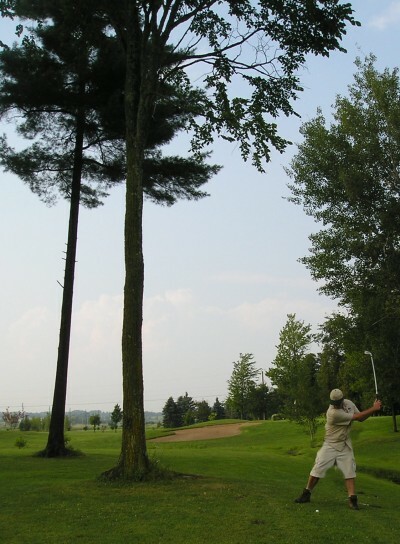 Lovers of Golf can find many golf courses in the Eastern Townships. With courses for all skill levels and budgets there is a course waiting for you near Knowlton or in Bromont! Stay tuned for our upcoming golf review coming in August! George Bowser and Rick Blue have been writing and performing music and comedy together since 1978. Colorectal Surgeons around the world are familiar with them through the song ‘Working Where the Sun Don’t Shine’, which was first heard on ‘Madly Off In All Directions’ in 1997. This talented due is coming to Lac Brome with an all new show! Aug. 30,31 & Sept. 1 only. Big band sounds played for your enjoyment in Coldbrook Park in the center of the village. Presented by The Knowlton Harmony Band. One hour free concert at 3:00 p.m. Yes we have big-screen movies in Knowlton! Perhaps not as regular as the Princess Theatre in Cowansville but certainly our venue has better seats! Come see movies on the big screen with your friends and neighbours the way people did before DVD players and cable TV drive wedges through the social fabric of our generation! The golden age of cinema can be yours right here in lovely Lac Brome. Make your Sunday nights into a romantic event…see a movie and smuggle in your Licorice so you feel a little wild! Tickets are only $5 for members and $7 for non-members. Showings at the comfy Arts Knowlton at 9 Mount Echo Road. Call 450-242-2270. Drama directed by Richard E. Grant (Withnail and I). During the last gasp of the British Empire in Swaziland, South East Africa, in 1969, 11-year-old Ralph witnesses his mother’s adultery with his father’s best friend. His parents divorce and Ralph is sent to boarding school. His father, Harry, not only loses his wife and best friend, but also his position as Minister of Education with the coming of Independence, prompting his rapid descent into alcoholism. Now 14, Ralph returns home to discover that his father has re-married an ex-air “hostess” named Ruby whom his father has known all of six weeks. As round a peg as you could find in this square holed society, Ruby ridicules the petty snobbery of the restless colonials whose chief amusements are gin, adultery, and their foppish slang of “toodle-pip” and “hobbly-jobbly” — that Ruby identifies as sounding like “Wah-Wah.” Although Ralph is initially wary of Ruby, he bonds with her as his father’s drinking escalates and becomes dangerously out of control. It’s this chaos that stokes Ralph’s inner turmoil, and eventually forges his creative mind. A drama tracing six days in the lonely, violent life of Tsotsi (meaning “thug”), a ruthless, young gang leader. Bolstered by his small crew of social rejects–a failed teacher, a dim-witted heavy, and a cold-blooded assassin–Tsotsi refuses to think further ahead than the raids of the coming night. But when an impromptu car jacking results in the accidental kidnapping of an infant, Tsotsi comes to care for the child and begins to gradually rediscover his humanity, dignity, and capacity to love. 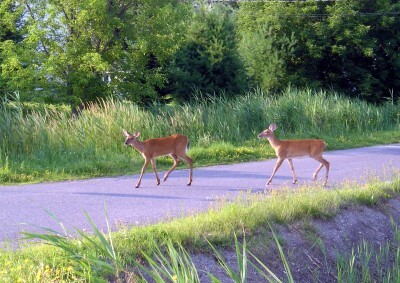 Residents of Lac Brome are used to seeing young deer springing through the bushes and grases in Summer. Drivers need to be cautious at all times as there are many deer who can get dis-oriented when they get into residential areas. Friday August 8th HOT PICK! Back By Popular Demand! Angel played in June in Knowlton and it was a fantastic show by all accounts! Things got so hot they had to bring her back for more! August 8th the Knowlton Pub is pleased to have Angel Forrest back again featuring an intimate evening of music. Angel Forrest was nominated in three categories for the 2007 Lys Blues prizes, which are “Blues artist of the year”, “Best performance”, and “Best show”. Her musicians Denis Coulombe (guitar), Rob MacDonald (guitar) and Sylvain Coulombe (drums) are also nominated in the “Best musical performance of the year” category. Following a successful string of sold out shows in Quebec, Angel toured Ontario from March 27 to April 14 in support of “Here For You”. Don’t miss a chance to catch her live back home here in Brome at the Knowlton Pub! Check out the official Angel Forrest Webpage for more information and songs from the powerful artist. The Knowlton Pub, right downtown in Knowlton, features great food and entertainment on a regular basis. One of the more popular places in Knowlton this evening of music featuring one of our local Superstars will surely be a big hit! The Knowlton Pub is right Downtown…if you don’t know where it is…ask anyone…we all know it well! The Knowlton Pub also has a very popular open Mike every Thursday night at 9 PM. pm. During the Bel Canto festival the Pub will be extending their dining hours on concert nights to accommodate patrons who wish to eat after the concert. They will also have a table d’hote featuring a ‘Rossini’ recipe during the Festival. The Hot days of August are perfect for a picnic! What could be more fun during the Dog Days of Summer than a couple of Hot Dogs! The fresh local corn is succulant and sweet and many roadside kiosks sell the corn at a great price! 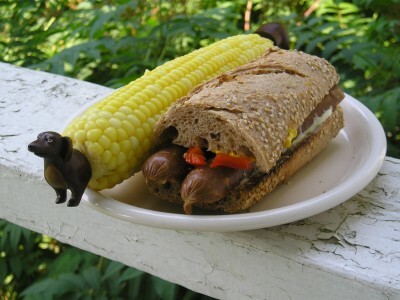 Add a hot veggie-dog on a baguatte and you have a perfect Summer treat! Knowlton’s favorite downtown gallery presents a spotlight on artist Desmond Senior’s paintings and Isabelle d’Hauterive’s unique figurines. Sunday, August 10 from 12:30 p.m. to 4:30 p.m., the artists will be present. Galerie Knowlton, 285, ch. Knowlton. Information: 450-242-1666. Invited artist Ingrid Bird shows her collages. Show open during Library hours. Pettes Memorial Library, 276 Knowlton Rd. The Dik & Mitzi “ANNIVERSARY SHOW” New Vaudeville Song, Dance, Tap, Slapstick … sheer joy and entertainment. Theatre Lac Brome/Arts Knowlton, 9 Mont-Echo. Box Office: 450-242-2270. Ricky Blue is Frank Sinatra as he performs songs from the great American songbook made popular by old “Blue Eyes” himself. Theatre Lac Brome/Arts Knowlton, 9 Mont-Echo. Box Office: 450-242-2270. By Laura Teasdale. An outdoor performance based on an historic tale from Brome County. Theatre Lac Brome/Arts Knowlton, 9 Mont-Echo. Box Office: 450-242-2270. The Four Anglos Present: “The 25th Century Belongs to Canada” . Anyone who has lived in Quebec for longer than 6 months has certainly heard the names Mosher, Freed and Bowser and Blue! Mosher is the renowned Gazette cartoonist and author, Freed has been a writer and columnist for decades and Bowser and Blue are some of the funniest commedians and satirical songwriters ever produced in Quebec! We are lucky to be treated to an evening of live entertainment with all four of these crusty characters in one place, none other than our own Knowlton Theatre! The show, starring Ricky Blue, George Bowser, Josh Freed and Terry Mosher is a A multimedia mixture of songs, satire and cartoons. Get your tickets soon because this sort of quality talent in one place at one time is a rare treat and we’re lucky to have it here! Theatre Lac Brome/Arts Knowlton, 9 Mont-Echo. Box Office: 450-242-2270.